It is impossible to live a happy and successful life without practicing the virtue of patience. There are so many circumstances in which we have to wait. 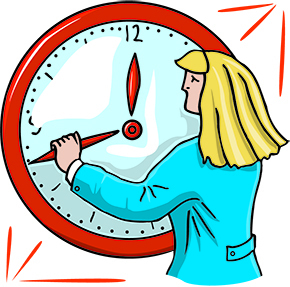 Sometimes we would like to reach up and advance the hands of a clock two or three hours. That could easily be done. But it would not really advance the time. It would make the clock wrong. We cannot rush time. And we have to wait for the process of nature to advance the same way. A rosebud blooms in its own time. To experience the beauty of flowers, we have to wait and give them time to bloom. We have to wait for train time when we go on a trip. We have to wait for the arrival of summer before we can go swimming in the ocean. A good part of our life is made up of waiting. If we lack patience, the need to wait can cause a great deal of anguish and frustration. Two men in a boat once ran aground on a sandbar. They tried every way they could to free the boat, but to no avail. One of the men became very excited. However, his friend just sat down and relaxed. "Doesn't it bother you that we're stuck?" the first man asked. "We need only wait until the tide comes in, then our efforts will be useful." said his friend.